KARACHI: The caretaker Sindh Chief Minister, Fazal-ur-Rehman, has said the media is the most important pillar of our country and it has to play a very constructive role in holding free, fair and transparent general elections on July 25. Fazal-ur-Rehman was talking to a delegation of the All Pakistan Newspaper Society (APNS) led by its President Hameed Haroon. Fazal-ur-Rehman said the media has a huge responsibility on its shoulders to support the caretaker set-up for holding free, fair and transparent elections in the country. “I am sure with our [government and APNS] joint efforts the people would come out in large number to cast their votes in the election,” he said. 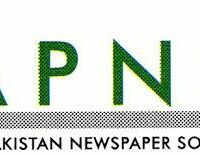 The APNS delegation told the chief minister that the media, particularly the newspapers, have always played an effective and constructive role whenever the nation passed through a difficult phase. “The national media through different campaigns, news stories, editorials and articles united the nation against war on terror, targeted operations and also worked for the inter-faith and sectarian harmony,” they said. They APNS delegation said the media has also worked for the continuity of the democratic process and has supported the political system to strengthen democracy. They assured the chief minister that the media would play its due role to educate the people so that they come out in a large number on the polling day to cast their vote. They hoped the turnout would increase in 2018 election substantially. The APNS delegation also told the chief minister that their dues are lying outstanding against the provincial government. On this, the chief minister assured the APNS members of clearance of all dues after July 15 when the budget for next financial year is released. The delegation invited the chief minister for dinner at the APNS House, which the chief minister accepted and thanked them for invitation. The other members of the APNS delegation present in the meeting were Kazi Asad Abid, Sarmad Ali, Ali Hasan, Javed Mehar Shamsi, Younas Mehar, Bilal Farooqui, Kazi Aslam, Rafique Pirzada, Shahab Zuberi, Najamuddin Sheikh, Faisal Zahid Malik, Mumtaz Ali Phulpoto, Mangal Das Arwani, Mukhtar Aqil, Dr Abdul Wasay Shakir, Faisal shah Jehan, Dr. Tanvir Tahir and Imtiaz Qazi.